The Acropolis and Asklepion of Pergamum, are listed among the top 100 historical sites on the Mediterranean. It is also home to one of the seven churces of the Apocalypse. Still, it is a hard sell. 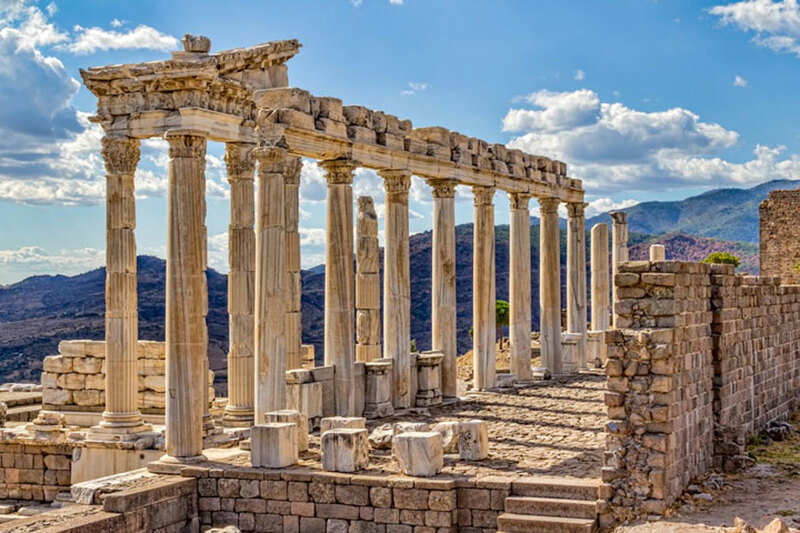 The ancient city of Pergamum (also written as Pergamon) dates back to the 12th century B.C. but saw its first notable era of prosperity under Lydian King Croesus in the 6th century B.C. Pergamum briefly fell under Persian control but was wrestled back into Hellenistic hands in 334 B.C. by Alexander the Great. While Alexander was out conquering other lands, Anatolia was left in the hands of his general , Lysimachus, who had entrusted his war chest to the hands of Philataerus, commander of Pergamum. On Lysimachus’s death, Philataerus founded a ruling dynasty with the late general’s riches and was succeeded by his nephew , Eumenis I. Eumenis II is credited with bringing the empire to its height, ushering in a period of economic, cultural and artistic expansion in the 2nd century B.C. When Attalus III, the last of the ruling Attalid dynasty, died, his ambiguous testament was interpreted by Rome as carte blanche for the Romans to come take over. Under the Romans, Pergamum reclaimed a measure of its former greatness, but the town was all but forgotten once the Ottomans took control. Most of the extraordinary buildings and monuments date to the time of Eumenes Eumenes II (197- 159 B.C. ), including the famed library, the terrace of the spectacularly sited hillside theater, the main palace, the Altar of Zeus and the prophylaeum of the Temple of Athena. The ancient city is composed of the Acropolis, whose main function was social and cultural as much as much as it was sacred ; the Lower City, or realm of the lower classes ; and the Asklepion, one of the earliest medical and therapeutic centers on records. End of tour transfer to airport for flight back to Istanbul. Upon arrival transfer to Hotel .